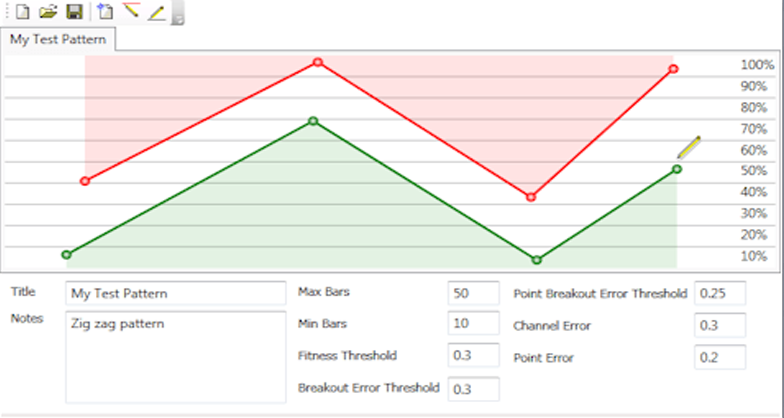 Advanced Automated chart pattern Recognition with Fuzzy Logic. You can think of a chart pattern as a complex variation of the trendline, typically with upper and lower boundaries which represent support and resistance levels. Chart patterns are an important analysis tool. There are hundreds of different chart pattern types in existence, ranging from flags and pennants, to double top and double bottoms, Elliott waves, head and shoulders, wedges, channels, triangles and other patterns. With so many different patterns it becomes difficult to identify them, especially in real-time when trading live, fast-moving markets. Our Advanced Pattern Recognition library allows developers the opportunity to program trading strategies which automatically detect patterns on charts. 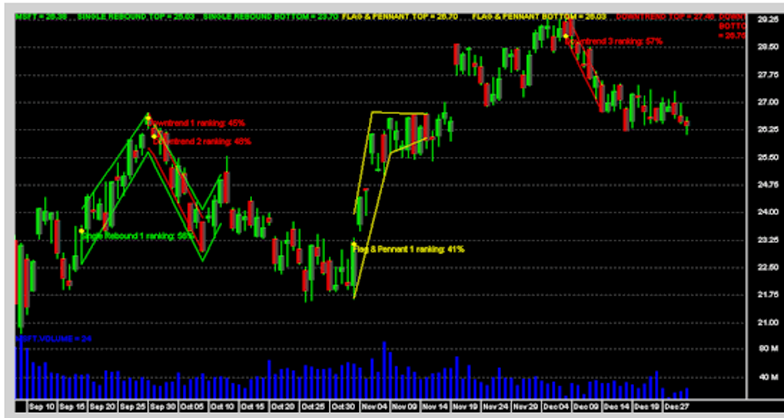 How does Fuzzy Logic help find chart patterns? When we released PatternLogic, it is the first template-driven, fully dynamic pattern recognition engine for identifying patterns in financial data. Traders use implicit learning to identify patterns in price data. When traders are repeatedly exposed to certain price patterns, they eventually develop a personal understanding for the pattern, even though the pattern and predictive feeling cannot be explained in words. PatternLogic identifies patterns as human traders do. PatternLogic features several optimization parameters, which allow for the fine-tuning of the fuzzy logic pattern identification process based on the preferences of the trader. PatternLogic can be used to create real-time pattern alerts or back testing strategies, based on pre-defined or custom pattern definitions. PatternLogic comes with several pre-defined patterns such as Channels, Double Bottoms, Double Tops, Flags, Head & Shoulders, Pennants, Trend, Triangles, Triple Bottoms, Triple Tops, Wedges and other patterns. Custom patterns can be created using the supplied pattern designer utility, which you may deploy to your end users.